The built-in “Pay by Check” payment gateway allows members to complete membership checkout online and make payment via another method. 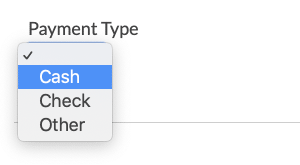 This recipe will add a dropdown to membership checkout allowing users to select “Check”, “Cash”, or “Other”. The selection is saved in the user’s profile and the order for the admin’s reference when collecting payment.